Much like the votes in Florida’s Nov. 6 elections had to be recounted, information regarding Hurricane Michael’s vicious romp across the state is also being recounted and, in some cases, revised. As a result, some preliminary facts about the historic storm could be adjusted. 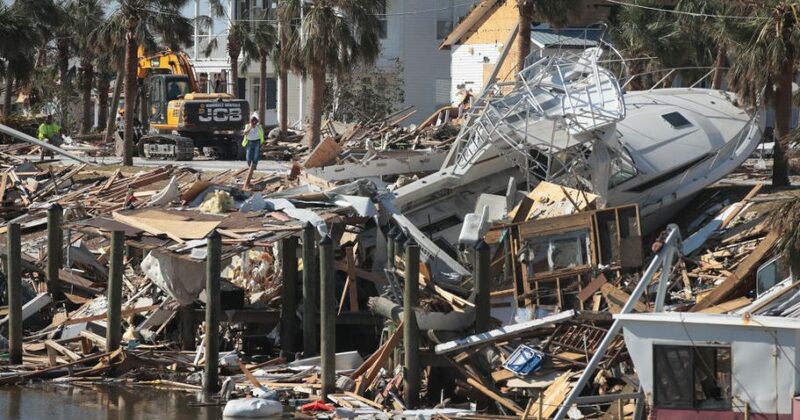 For instance, Hurricane Michael may not have been a Category 4 but a Category 5 storm, and initial estimates of the property damage it caused in Florida alone may exceed $12 billion — more than double initial estimates from insurance industry analysts. Hurricane Michael slammed ashore Oct. 10 near Mexico Beach in Bay County — less than four days after it appeared in the southern Caribbean as a tropical depression — before ripping across southeastern Georgia and into the Carolinas, killing at least 45 people and leaving 1.2 million homes without power. At least 36 of those deaths were in Florida – although even that figure remains in flux and will for the foreseeable future. Initial estimates pinned damage across the four states at $14.58 billion, including $6 billion in destroyed fighter jets at Tyndall Air Force Base. Losses to agriculture and timber alone exceeded $5.18 billion in the states hammered by Michael. Now, insurance analysts say Michael caused between $10 and $12 billion in damages in Florida alone. With 2017’s Hurricane Irma — a much larger but less violent storm that caused an estimated $30 billion in damage — the state has absorbed more than $40 billion in damages from the two storms. As of Nov. 9, according to an aggregate of claims data filed by insurers with the state’s Office of Insurance Regulation, Floridians had filed 119,160 insurance claims related to Hurricane Michael, including 82,485 by residential property owners and more than 37,000 by businesses. More than 71,000 are from Bay County. Of the 82,485 residential claims, nearly 35,000, or 42.4 percent, had been paid. Of the nearly 37,000 business claims, 60.4 percent had been paid, although only 16.4 percent of 4,822 commercial property damage claims and 11.6 percent of the 630 “business interruption” claims had been resolved. As of Nov. 9, the OIR estimated insured losses were at $2.94 billion and counting, noting nearly 97,000 licensed and appointed insurance adjusters were “working the field” in the Panhandle. The good news, at least for the state government, is less than 3,500 claims were on property insurance policies issued by Citizens Property Insurance Corp., the state-backed insurer of last resort. Most of Citizens’ customers are in South Florida. The National Hurricane Center, meanwhile, has not completed its analysis of Hurricane Michael as National Oceanic and Atmospheric Administration scientists still sort through the data. Michael is officially defined as a Category 4 hurricane, with 155 mph sustained winds when it made landfall. But it could potentially be revised to a Category 5 if NOAA scientists find evidence of winds exceeding 157 mph. A still-unfolding analysis by their colleagues at the U.S. Geologic Survey indicates Michael may have been worse than initially reported and, indeed, may have been a Category 5 storm. The USGS concludes the storm surge at Mexico Beach reached 15.55 feet, a half-foot higher than previously cited. The USGS report calculates Michael’s eyewall had “mini-swirl” winds in excess of 200 mph, which is equivalent to an EF3 tornado and strong enough to destroy solid homes and fling cars through the air.